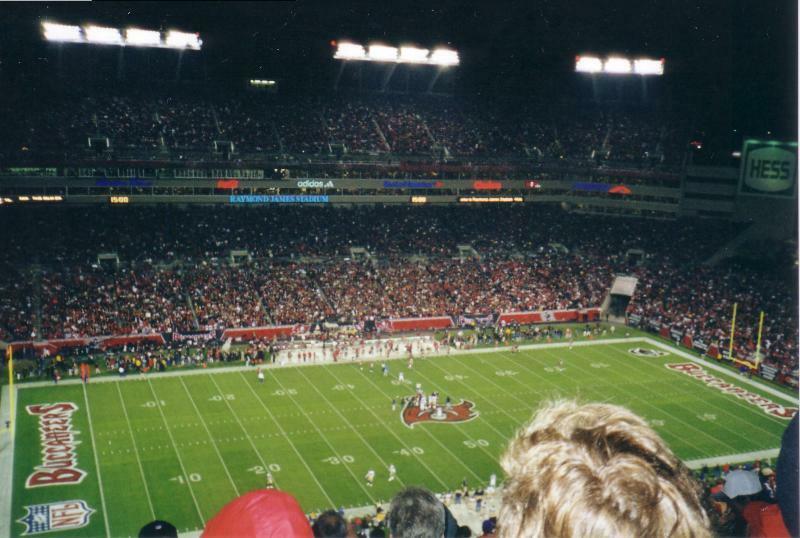 Monday Night Football Dec. 18, 2000 it was the Tampa Bay Buccaneers vs. the Saint Louis Rams. 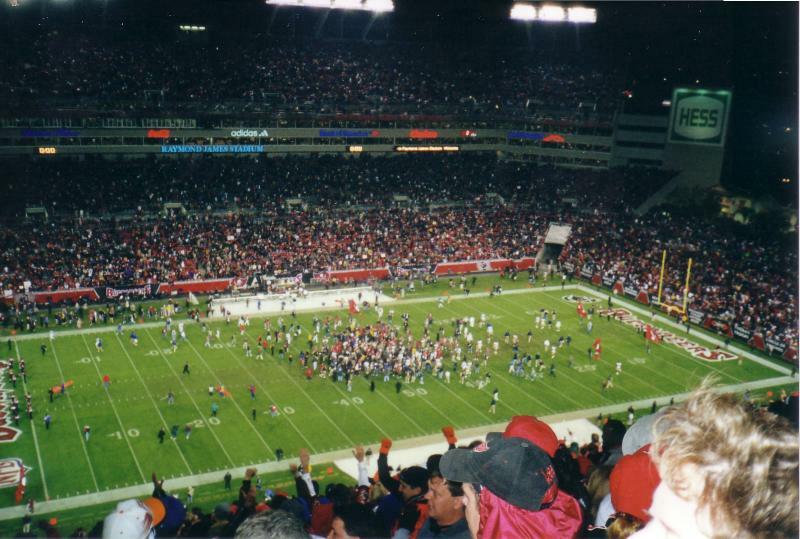 All of Tampa Bay was waiting for the rematch after losing to the Rams in the NFC Championship game the year before. I remember when I first received my season tickets in the mail and saw the match up with the Rams. I marked my calendar that day and started counting down to game time. At the beginning of the year, I told my friend Jason that he could go to one game this year and he chose the Ram game. Due to the fact that the game was at night and in the month of December it didn't take much convincing for my wife to give up the ticket. Those night games in December can be cold and this one was no exception. 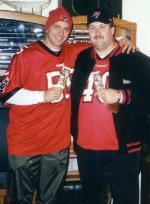 I remember Jason and I posing for a picture with tickets in hand before the game. 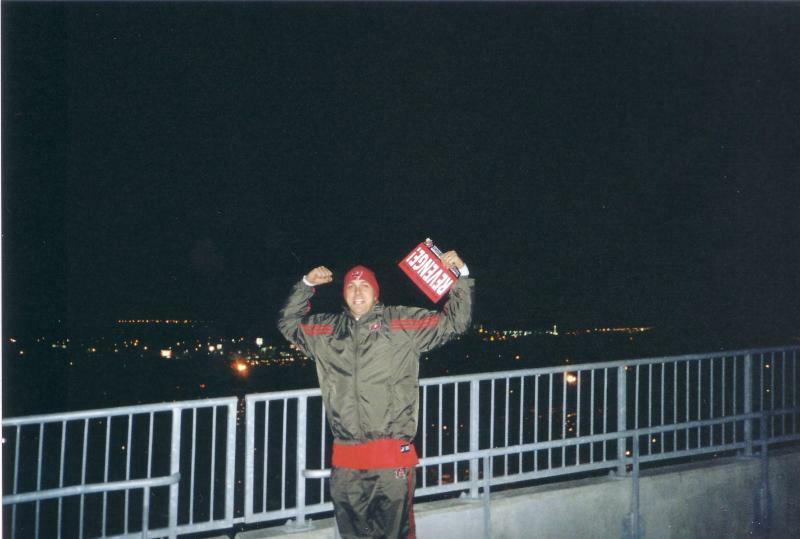 I think even then we knew that something special was going to happen that night. The buccaneer fans turned out in droves. People were all painted up and some even wore costumes. 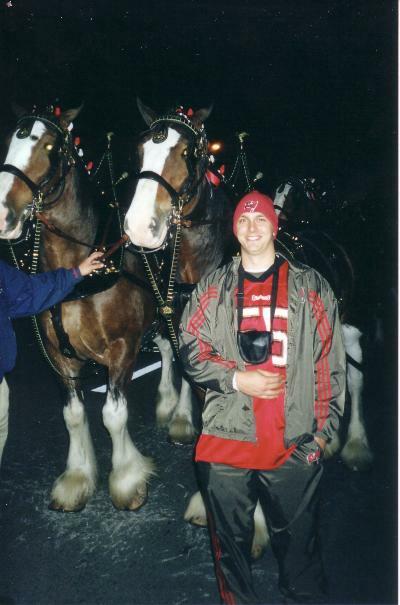 Budweiser even sent the Clydesdales over to join in all the pre game festivities. 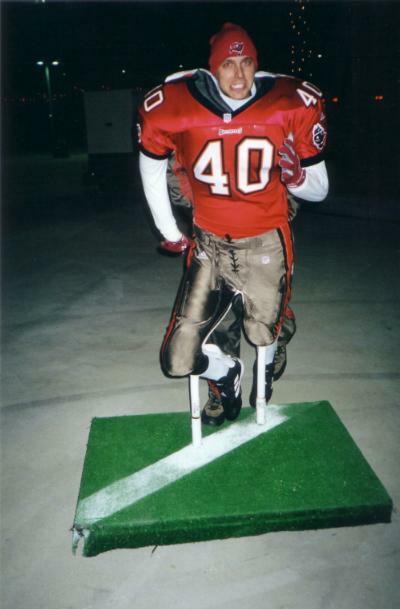 Jason and I tried to get into the Buccaneer's locker room by posing as Keyshawn and Alstott but we were turned away. I thought I was convincing as Keyshawn, I should have had a little more bling bling but I think they bought it. 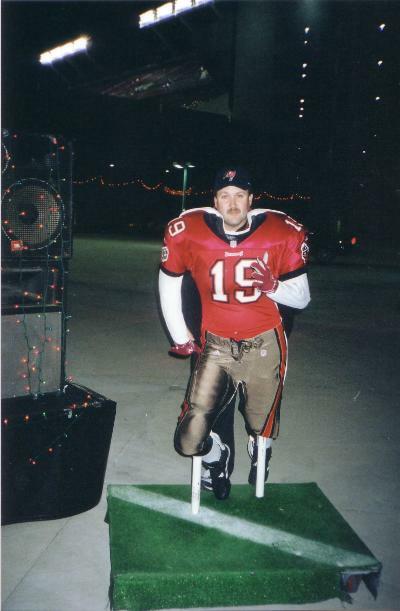 Jason on the other hand was spotted right away not sporting the traditional Mike Alstott goatee. 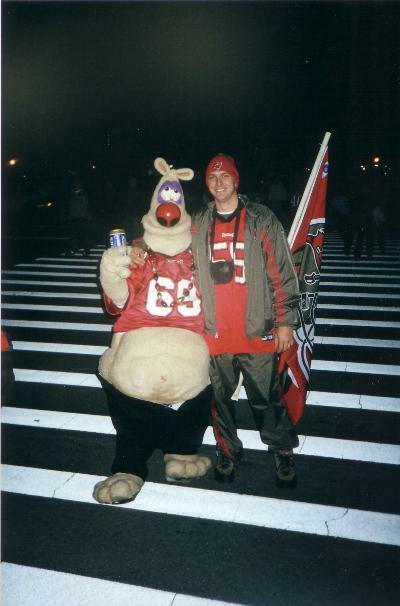 As we walked into Raymond James Stadium we were given Buccaneer Decal car magnets and little hand held signs that simply said Revenge. I still have the car magnet and use it for luck anytime we have a home Monday Night Football game. When we got to our seats much to our surprise Isaac Bruce and Marshall Falk were sitting right behind us. Ok, it was two guys wearing Rams jerseys. I remember Jason saying "great if the Bucs don't play well we will be hearing it from the two behind us all night". Before the game started the two Ram's fans behind us started talking trash. I remember in the second quarter when the Rams scored their second touchdown the two behind us said "the flood gates are open now, the Bucs may have confused us early, but they can't stop us now." At halftime the score was Buccaneers 24 Rams 14. Our Rams fans still seemed confident but they weren't as talkative as they were at the beginning of the game. The second half was even more exciting than the first. The two Rams fans behind us didn't come back to their seats after halftime, I'm not sure where they went. Then late in the 4th quarter Tory Holt scored on a 71 touchdown pass with just a little more than 5 minutes left to make the score Buccaneers 31 Rams 35. The two Rams fans as if out of nowhere appeared back in their seats and talking all kinds of trash. 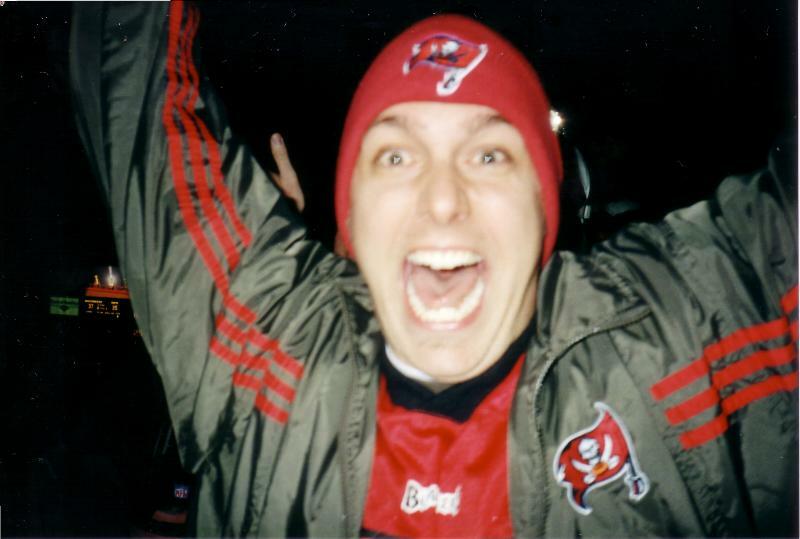 I told Jason that I was still confident that the Bucs could pull it out, but I must admit with the time winding down I was starting to lose hope. With a little more than 2 minutes left in the game the Bucs had the ball on their own 20-yard line. I remember thinking to myself we need a big play to win this game. After a strange incompletion that was near no receiver, the Bucs' came up with an amazing play to get deep in Rams' territory. King threw a screen pass to Dunn, who was met immediately by Carter. Dunn tried to spin away from Carter, but couldn't escape the Ram's grasp on his jersey. Before he could be pulled down, however, Dunn alertly pitched it back to King, who managed to scramble up field for 29 yards to mid-field. A late-hit penalty tacked on 15 yards to the 35. Later in the drive King pitched to Dunn, who began to sweep left then cut up towards the goal line and dove in for the go-ahead score. 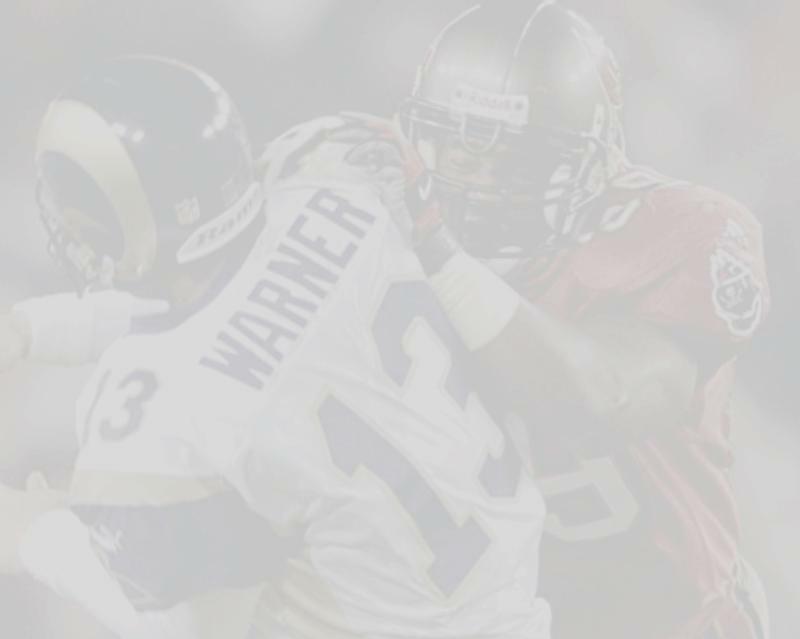 Dunn's career-best third touchdown tied the Bucs' record for rushing touchdowns in a single game. The stadium exploded as Dunn crossed the goal line. I was able to capture Jason's reaction after Dunn scored. The final score was the Buccaneers 38 the Rams 35. I remember thinking as I was walking out of the stadium that I had witnessed one of the best Monday Night Football games that has ever been played. Even as I write about this game it still gives me goose bumps. This was the best football game I have ever seen live and in person. I still have my ticket stub. Oh, the two Rams fans that were behind us were still sitting in their seats with a look of disbelief on their faces as we left. They seemed to be out of things to say.